Rev. 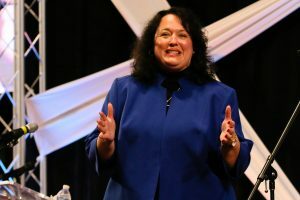 Dr. Leah Hidde-Gregory, a district superintendent and dean of the Cabinet in the Central Texas Annual Conference of The United Methodist Church, addressed the 2018 Global Gathering of the Wesleyan Covenant Association, focusing on the theme “Unashamed of Christ and His Claims.” We are pleased to release a video of her message. Speaking to more than 2,500 laity and clergy gathered at the live venue at Mt. Bethel United Methodist Church in Marietta, Georgia, and at 105 simulcast sites, Hidde-Gregory declared, “I stand today unashamed of Christ because of what he has done in my life and what he has done in the lives of others.” Hidde-Gregory shared her story of brokenness and how Jesus met her in a church that unapologetically declared both the hard truth of God’s plan for human flourishing and the messy grace of God’s transforming love. “Because you see, in this community of faith where people were met with hard truth and messy grace, I watched person after person be transformed. [It was] a message that included the doctrine of sin and the doctrine of grace. I watched people turn loose of what was unholy in their lives and grab hold of God,” Hidde-Gregory proclaimed. Christ is making all things new. Jesus is the Messiah – the Savior who takes away our sins. You can watch Hidde-Gregory’s entire presentation here and download it to share with others. You can also watch the opening message brought by Bishop Mike Lowry here and download it as well. Additional messages from the WCA’s Global Gathering will be released in the coming days.